It is about time I reveal Miss S' nursery don't ya think?! It used to be our guest room and we knew we would have quite a few guests after S was born so we just kept the mattresses on the floor in there until all the guests had visited. Now that we don't expect anyone else, we were able to take the mattresses out and I could finally take pictures of her room. So without further ado... here is her nursery reveal. 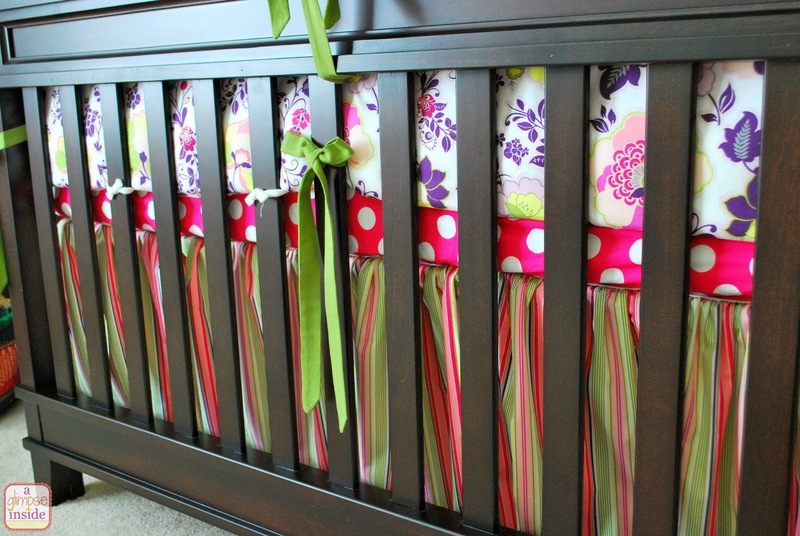 I will start back at the beginning before I get into all the decorative details of her room. 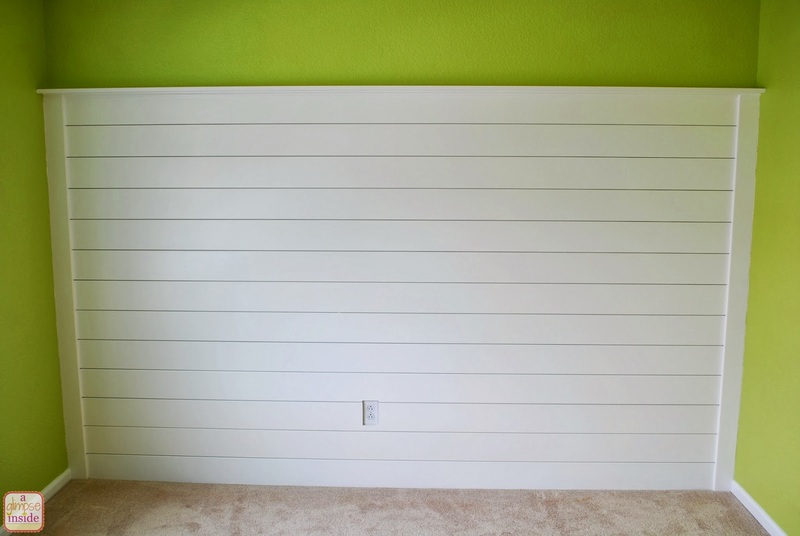 You will probably recall that we built the plank wall on one wall of the nursery. 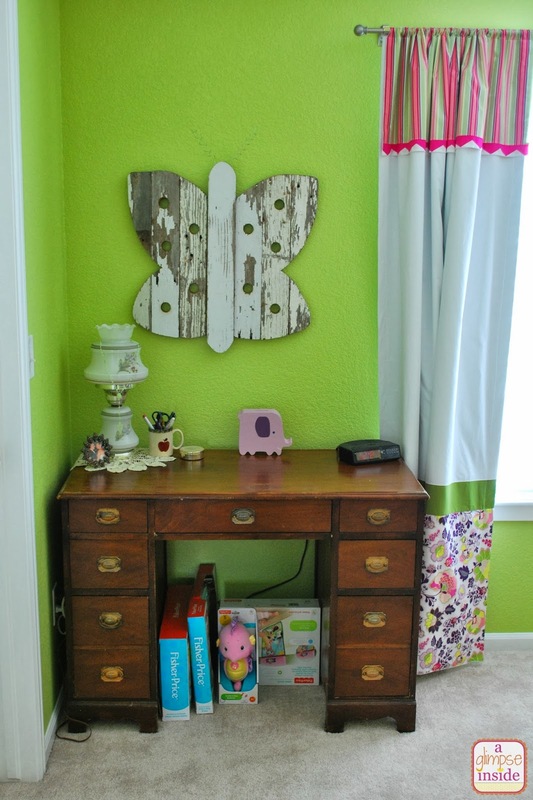 We also painted the room a pear green color and oh boy... was that an adventure to pick the paint! We weren't sure if we were going green or purple so we first brought home purple paint samples and I painted them all over the room. I wasn't happy with the purples so off to Lowe's to find a green. I took the fabric and their color matching machine was broke so we just tried to get as close as possible. I came home and painted the greens all over the room and I still wasn't happy so I decided to mix the greens together and that was the color! Back to Lowe's I went and asked the lady, luckily the one who helped me earlier was still working, to mix the colors together. We started with one color and tried to make it darker and filled the can before we got to the color. So we reversed it and went darker and tried to go lighter and finally got it. I came home and started cutting in the room and as it was drying it started to look more baby food pea green than the pretty pear green. I was so mad! I didn't know what to do. Called Travis up and he hated it too so I told him to run downstairs and grab the green paint from the guest bathroom and the brown paint from the loft. He brought them up and I just started mixing them and slapping them on the wall until it was like the color I mixed of the samples.The next day, we painted the room and loved it. All I have to say is THANK GOODNESS we didn't run out of paint because there would be no way to get it to match perfectly again! 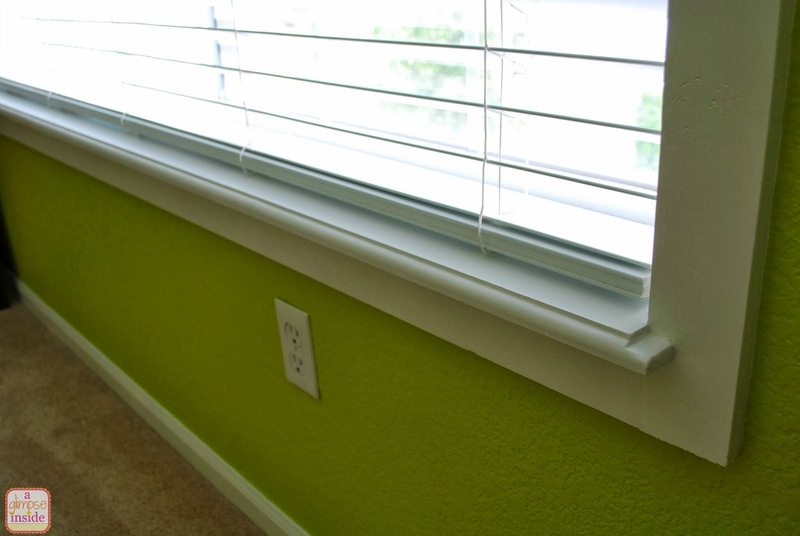 When we put up the plank wall, we also added molding around the window and put a board on the bottom of the sill. 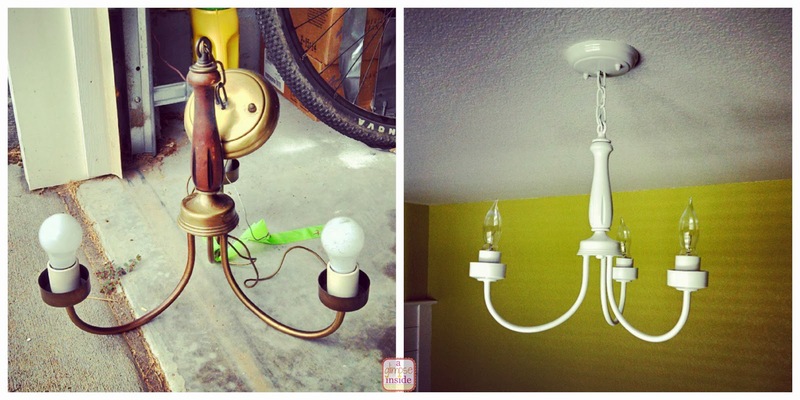 And lastly, we picked up this light fixture up at Habitat 4 Humanity Restore for $12. I just sanded it down, primed and painted it white and up it went. Love it! Now onto the decorations of the room. I will work my way around the room. When you walk up to her room, this is your view straight across from the door. The desk was already in the room so we left it and it will eventually get a makeover. Travis built the butterfly out of old wood that we had to hang on the wall. 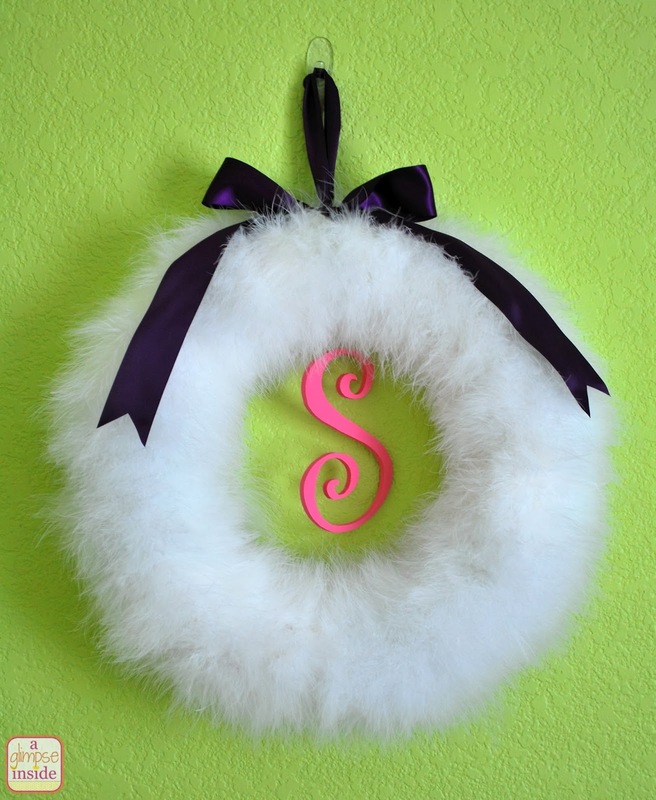 Between the closet door and the bedroom door, I hung the wreath that my mom made for the hospital door. This is the view looking into the room standing in the doorway. To the right of the doorway is the dresser we bought off Craigslist that I painted purple. 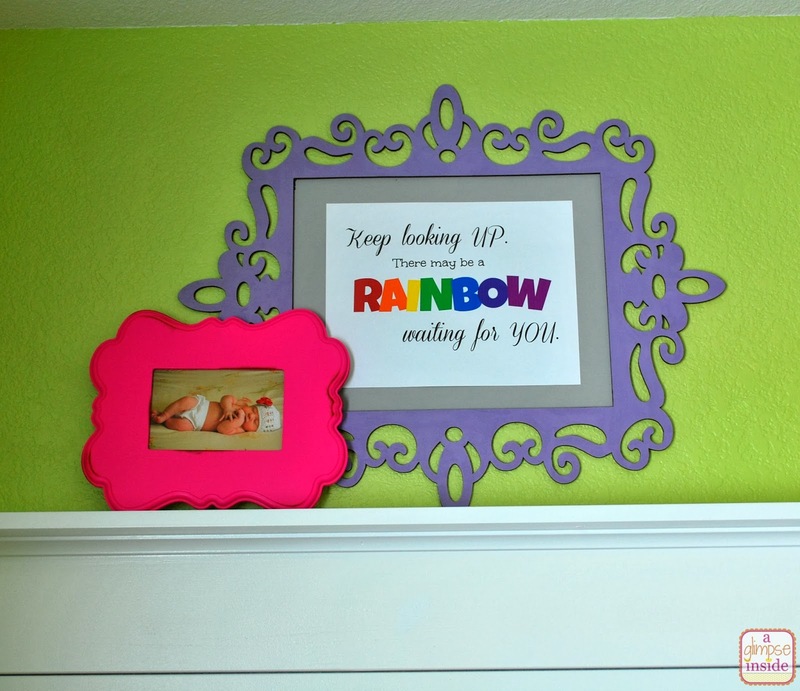 I bought the frames, most from Cut-It-Out, and painted them in the room's colors. I decided to change the top row of knobs on the dresser so went to Hobby Lobby and bought these cute green polka-dot knobs. Here is a shot of the frames. I created the printable for the large frame and then framed some newborn and maternity pictures. In the gray frame, I used a vinyl saying that I actually received from someone at SNAP last year, and just applied it to scrapbook paper. The plank wall was the perfect spot for the crib. 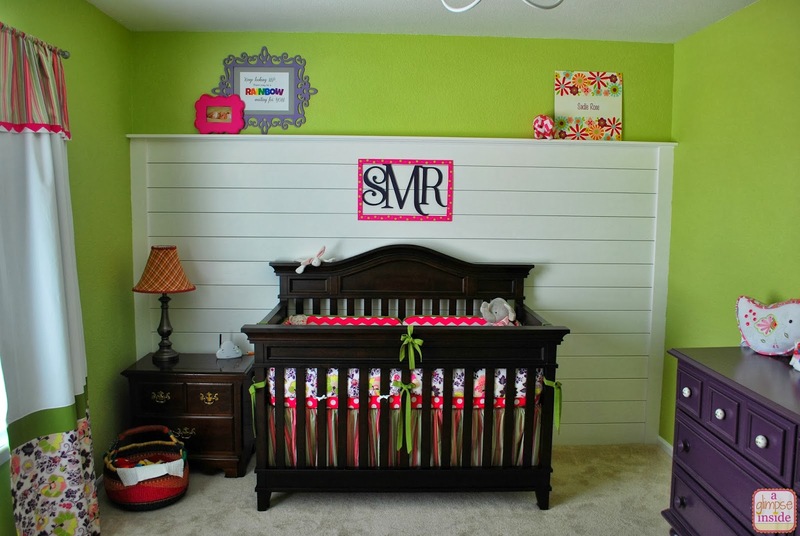 I hung the wood initial monogram above the crib and put some other decorations on the picture ledge of the plank wall. I still have plans to create a mobile for over her crib. The nightstand was already in the room as well so I kept it in there. It was the perfect place for the monitor and the lamp that was already already in the room. 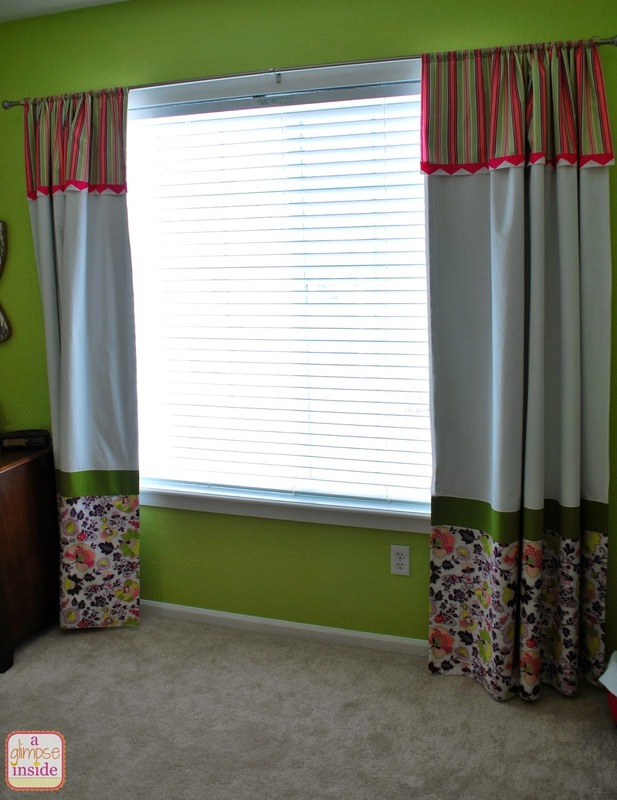 I lucked out that the colors in the fabric of the shade went with the room's new color scheme. I bought the basket at a craft fair and it was made in Uganda. Perfect place to keep toys. Above the nightstand on the ledge, I placed two frames. 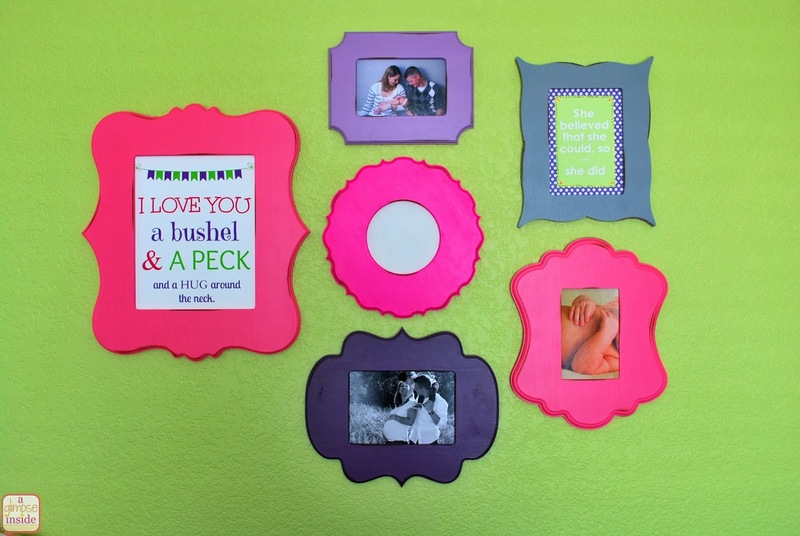 Put a newborn pic in one and then created another printable for the large frame. On the right side of the ledge, I placed a little stuffed elephant that matches her big sisters and then a print I purchased with her name on it. I bought all the fabric and had my mom make all of her bedding like she did for Miss P's nursery. I went with just stripes for the bed skirt and a coordinating floral print on the outside of the bumper with green accents. 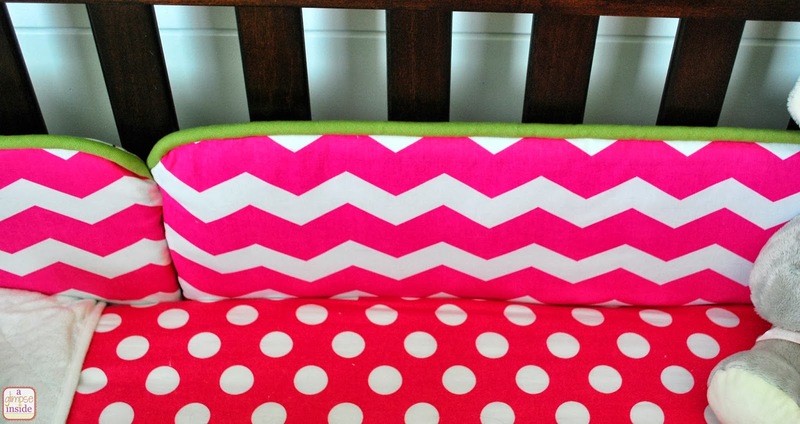 I went with a hot pink chevron for the inside of the bumper from fabric I bought at Hobby Lobby. 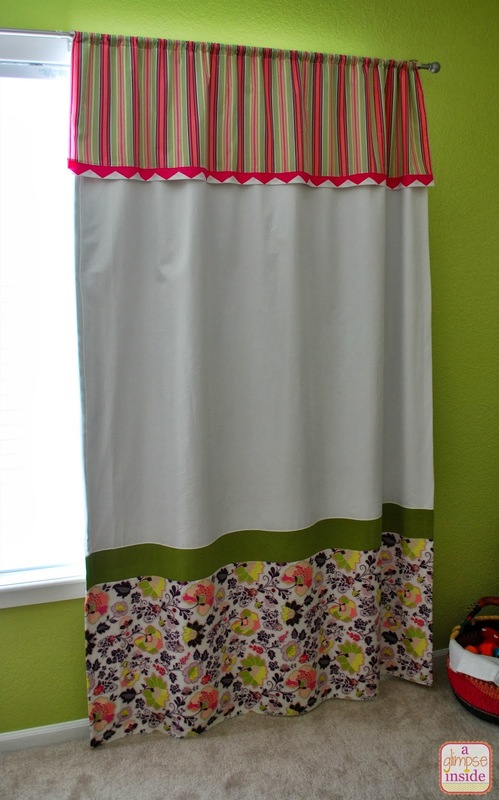 Here is her window and the curtains my mom also made. Here is a shot of the curtains closed. These were also an adventure! I pictured one thing but then once we got all the fabrics together it looked terrible. So we constantly messed with the arrangement until we found something that looked good and we liked. This was the winner... Stripes on top with a super small accent of the chevron, large chunk of white, small band of green, and floral band on bottom. So that would be her room! It's beautiful, Allison! I love all the bright colors. 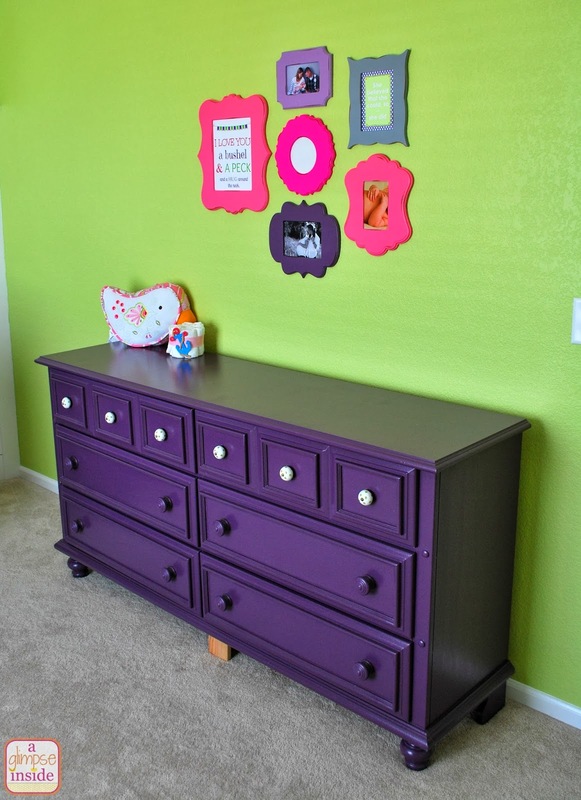 That wall is still my favorite part, and I adore the purple dresser. Oh my goodness I love it all!! How sweet! 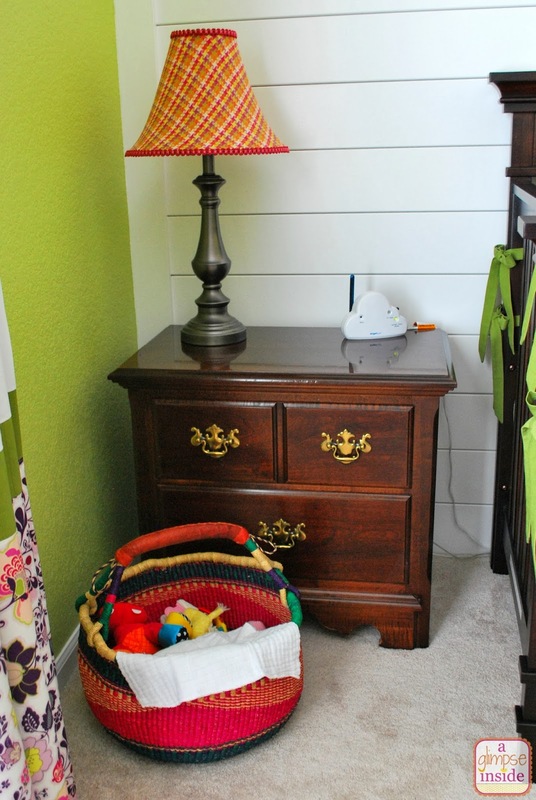 I especially like the plank wall the purple dresser. 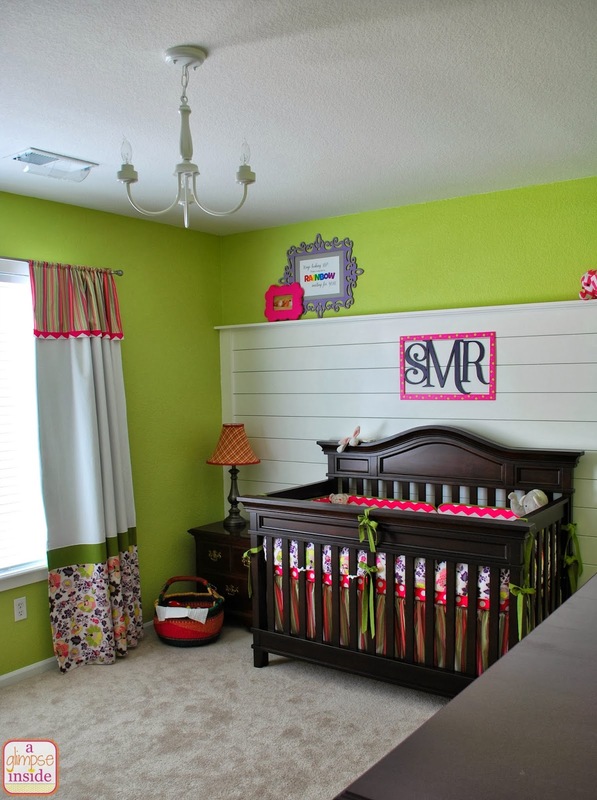 What a great nursery/kids room that will grow with her! Gorgeous room Allison! 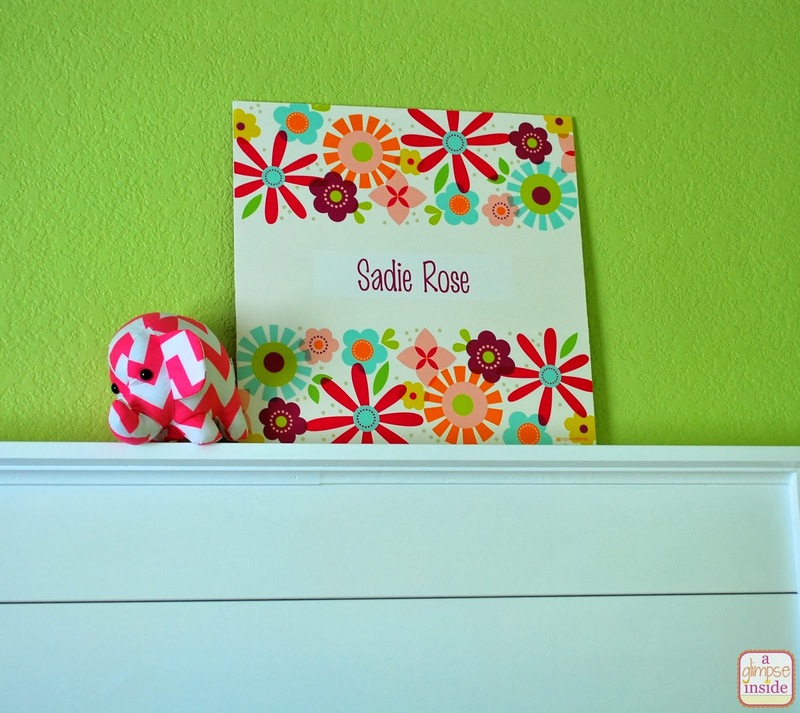 How did you make the printables for the room? 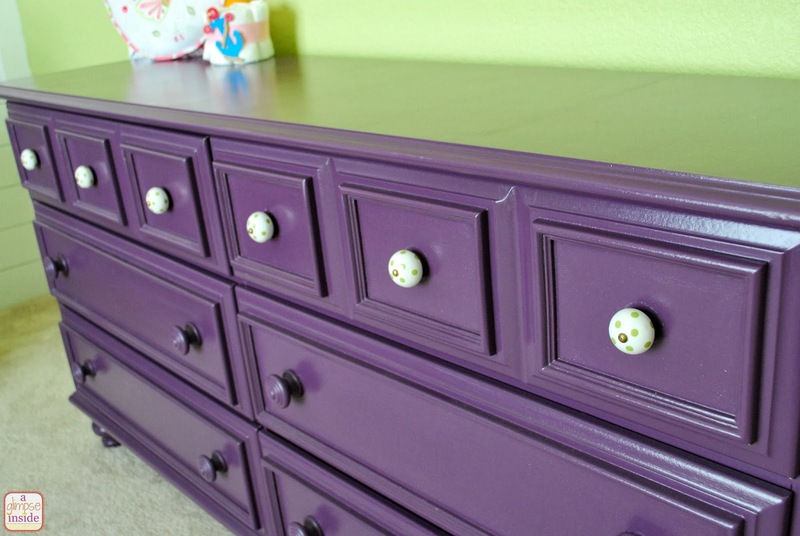 absolutely delightful … your paint story made me laugh but the color turned out dreamy. That's a blessed little girl!